The couple had three healthy children, but Hila is a carrier of the antibodies for lupus, an autoimmune disease which, even when not in an active stage, can cause a fetus to have life-threatening heart problems. Nevertheless, both Hila and Tal felt that their family was incomplete, so they decided to travel to Jerusalem from their home in the center of Israel to see a Hadassah Medical Organization specialist. It was six years earlier that Hila discovered she carried the lupus antibodies. The couple had been living in Holland at the time. They already had one child and Hila was pregnant with twins. 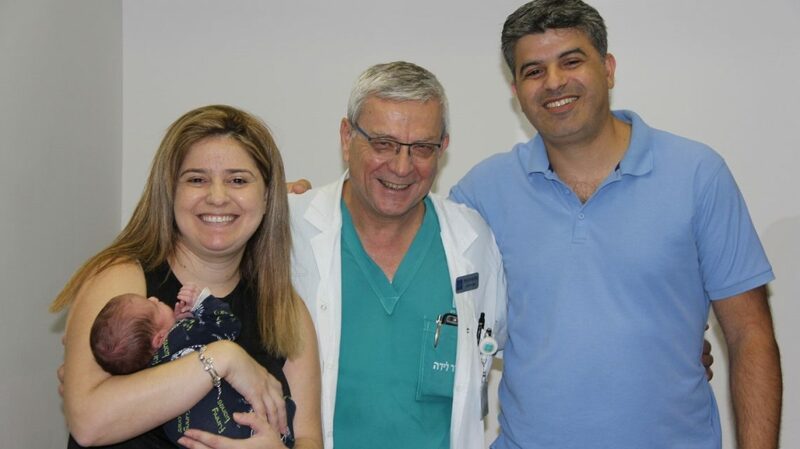 When they learned that Prof. Azaria Rein, head of the Pediatric Cardiology Department at Hadassah Hospital, was leading internationally acclaimed work in early diagnosis and treatment of heart blockages caused by the presence of lupus antibodies in a pregnant woman’s blood, Hila and Tal decided to consult with him. Prof. Rein encouraged them to continue with the pregnancy. The plan was for the couple to be treated by a colleague of Prof. Rein in nearby Belgium. One of their twins was born healthy and the other had a heart problem, which was successfully treated with the insertion of a pacemaker at birth. When the twins were a year old, the family returned to Israel and, two years later, they decided to act on their dream of having a fourth child. While many doctors discouraged them from taking the risk, at Hadassah, they found ready partners in Prof. Rein and Senior Obstetrician Prof. Uriel Elchalal. Once pregnant, Hila would have to be monitored closely, particularly as she reached the critical period of 16-25 weeks when the fetus’ heart could run into problems as it developed. The doctors’ plan was to treat the heart at the first sign of complications. While weeks 16 to 20 went smoothly, at week 21, instead of the typical slow changes that signal the beginning of a blockage, the baby’s heart went overnight from normal to experiencing a complete blockage (an atrioventricular block). With this disruption within the heart’s electrical system, the electrical signal from the upper chamber of the heart (the atria) is prevented from reaching the lower chambers (the ventricles). As a result, the heart’s ability to pump blood to the rest of the body is compromised. Prof. Rein treated the baby in utero with Dexamethasone, a fluoride steroid that crosses the placenta. He succeeded in completely resolving the blockage so that the baby’s heart began functioning perfectly. For the first time ever, a full atrioventricular block was totally reversed in utero.